Football has always been at the forefront of the fight for gender parity in sport. While tennis and horse racing have also made significant leaps in successfully integrating both genders into their respective sport, football’s prestigious status enables it to act as a medium for societal change. In the past, the sport’s governing bodies have tackled racism and obesity, but the meteoric rise of women’s soccer in recent years has transformed football into an important battleground for gender equality. 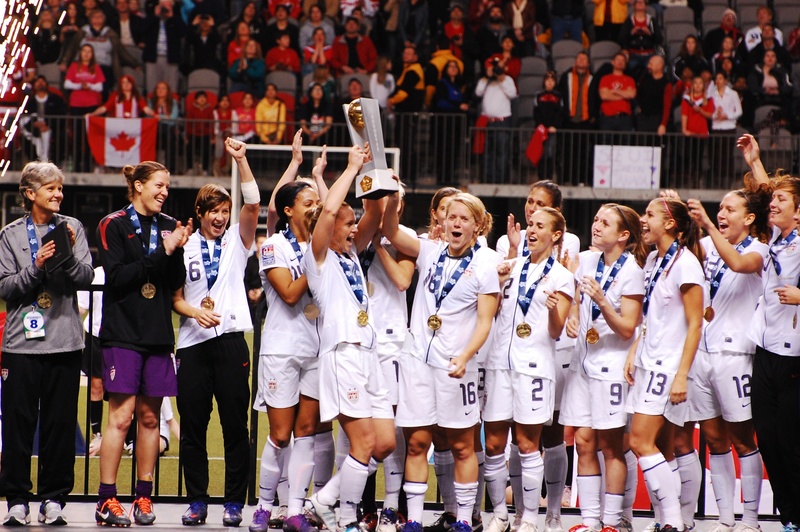 The US women’s soccer team has become a figurehead for women in sport. The current world champions massively overshadow their male counterparts, with players like Alex Morgan, Hope Solo, and Megan Rapinoe emerging as household names for fans of the beautiful game. Heading into this summer’s World Cup in France as hot favourites, the Stars and Stripes will undoubtedly be the main draw for supporters flocking to the centrepiece of women’s soccer. The team’s brilliance and passion is not limited to their exploits on the turf. Acutely aware of the struggles they faced as they sought well-deserved recognition, the players regularly use their considerable influence to further the causes of other teams. In 2017, players from the US women’s ice hockey team reached out to their soccer counterparts for advice on their own battle against USA Hockey for better pay and working conditions. Other women’s national teams, such as Spain and Norway, have followed the lead of the Americans in their quest for greater respect. Ultimately, all of these teams want respect. Female athletes are fed up with the notion that their trade seems frivolous compared to its male equivalent. On International Women’s Day, Serena Williams penned an essay for Fortune Magazine, criticising the way in which female athletes are depicted in the media. “Women,” she said, “are deemed ‘emotional,’ ‘hysterical,’ or ‘aggressive’, while men who behave the same way face no such consequences.” These attitudes stem from the general othering of female athletes by those in charge; there’s the Six Nations and the Women’s Six Nations; there’s Gaelic football and ladies’ Gaelic football. These minor discrepancies suggest that their game is somehow less intense or less physical than the “real thing”; a belief which is completely false. It is this togetherness and unity that is central to everything which these athletes strive toward. The collective efforts of all female athletes to be treated with more respect have certainly yielded some results. Yet, there is still evidence to suggest that while progress has been made, the media’s coverage and treatment of women in sport still falls well short of the mark. On IWD, as Williams was lamenting how sportswomen are portrayed, other outlets opted for flimsy, hackneyed articles and videos of athletes citing their sporting inspirations. These pieces are unimaginative, boring, and even slightly patronising. Some of Ireland’s most successful sports stars in recent years have been women, such as the Hockey World Cup runners-up and Katie Taylor, to name a few. Surely now, they deserve more from the public than a pathetic pat on the back. 20×20 has the backing of the Federation of Irish Sport, meaning that it is supported by major sporting bodies such as the IRFU, FAI, and GAA. However, where the initiative may fall down is its lack of a strong partnership with one particular sport. While the movement must establish ties with many different codes to function properly, a direct link with a major sport could act as a good measure of the initiative’s success. Moreover, there is such thing as too much choice, and newcomers may be overwhelmed by the huge variety of sports on offer and decide not to engage at all. Football – or soccer, depending on your personal preference – emerges as the ideal option. On a very basic level, it is incredibly easy to organise a game of football; all that is required is a ball and a pair of makeshift goalposts. Ultimately, the easier it is to arrange, the more receptive people are likely to be to it. Such an accessible and informal activity is very attractive to those who may be intimidated by the severity of a more professional setup. Ideologically, women’s football distinguishes itself time and time again as a voice for gender equality concerns. The US women’s team are suing the US Soccer Federation over allegations of pay discrimination, a struggle with which women across many different industries can identify. The inaugural and reigning Ballon D’Or winner, Ada Hegerberg, is set to boycott this summer’s World Cup in protest against the way in which the sport is treated in her native Norway. Upon being presented with her historic award last December, she was asked by host Martin Solveig if she was able to twerk. In the battle for gender parity, female footballers are fighting on the front line. Colgan mentions that the next phase in the 20×20 initiative will focus on role models for women in sport; never has there been such a need for role models for teenage girls than today. A recent study by Lancet revealed that Irish teenage girls rank among the top binge drinkers in the world. Young girls are crying out for a healthier activity and positive ambassadors with whom they can connect. Sport, and football in particular, can fill that void. The feats of the US national team, as well as the enterprise demonstrated by Tucker and Trinity Women’s Soccer, are shining examples of the merits of playing sport. Physical benefits aside, a robust team ethic can inspire athletes to pursue goals off the pitch and stimulate real social change. If the goal of 20×20 is to attain a greater level of respect for women in sport, football is surely the way forward.